Article: Tara Zepel. 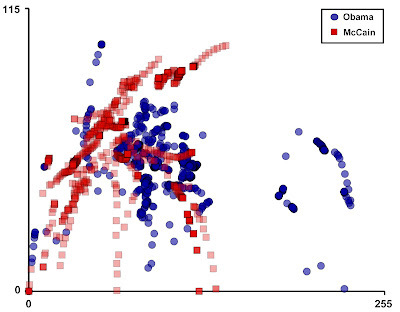 "Cultural Analytics at Work: The 2008 U.S. Presidential Online Video Ads." In Video Vortex Reader II: Moving Images Beyond YouTube, edited by Geert Lovink and Somers Miles, 234-249. Amsterdam: Institute of Network Cultures, 2011. [pdf 2.5 MB]. During the 2008 U.S. presidential campaigns, both Barack Obama and John McCain hosted their own YouTube channels and used the online video portals to showcase speeches, interviews, commercials and debates. The adoption of this developing medium as a political communication tool provides a unique and timely opportunity for exploring the ways in which the use of online video might have certain cultural implications – for the way we understand form and visual design and for the way visual rhetoric works on the socio-political scale of the Internet. 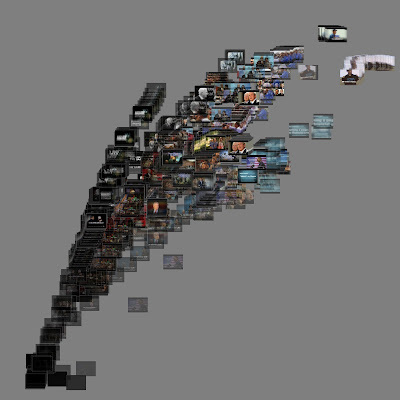 The visualizations that follow explore the potential connections between online video and political communication by analyzing a small sample set of commercial advertisements produced during the campaign. 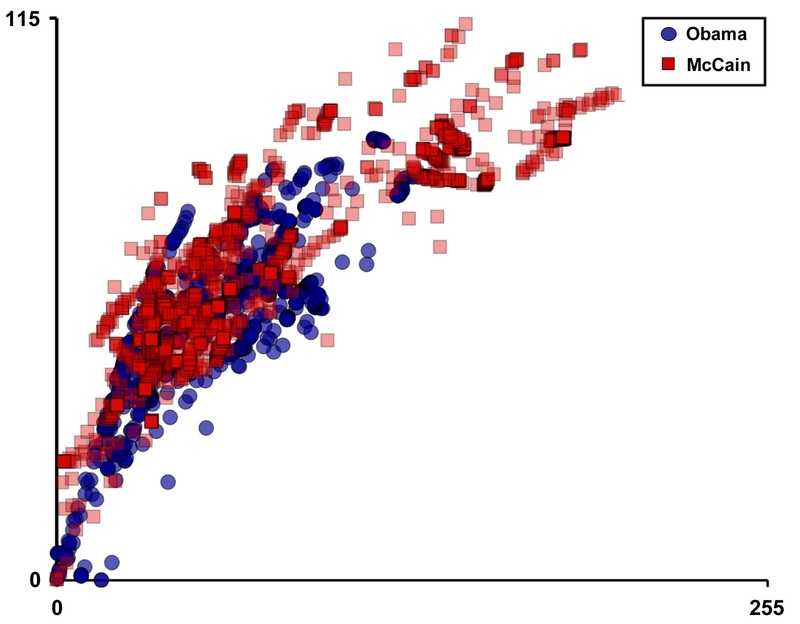 Highlighted here are the differences and patterns found in visual form between two subsets of the sample: 1) between ads originally designed for television broadcast and ads original designed for web broadcast and 2) between ads for Obama and ads for McCain. While all campaign ads in the sample set were posted and distributed on the web, those ads designed for television broadcast are visually different than ads designed for web broadcast across a number of visual dimensions. Comparing the television ads for both candidates leads to similarly counterintuitive observations: McCain’s TV ads are more visually aggressive and radical in visual language than Obama’s. Still frames and titles for each of the 12 campaign ads analyzed. 8 ads (4 Obama and 4 McCain) were aired on television and distributed on the web. 4 ads (2 Obama and 2 McCain) were aired exclusively online. All ads in the sample were officially produced and made available by the campaigns with the exception of D6, which was produced by the Democratic National Committee. All ads are available online on YouTube or at The Living Room Candidate, the Museum of the Moving Image's online archive of presidential campaign commercials 1952-2008. Fig. 1. Comparison of Visual Change in Obama and McCain Video Ads. Web commercials are more static than commercials made for television. 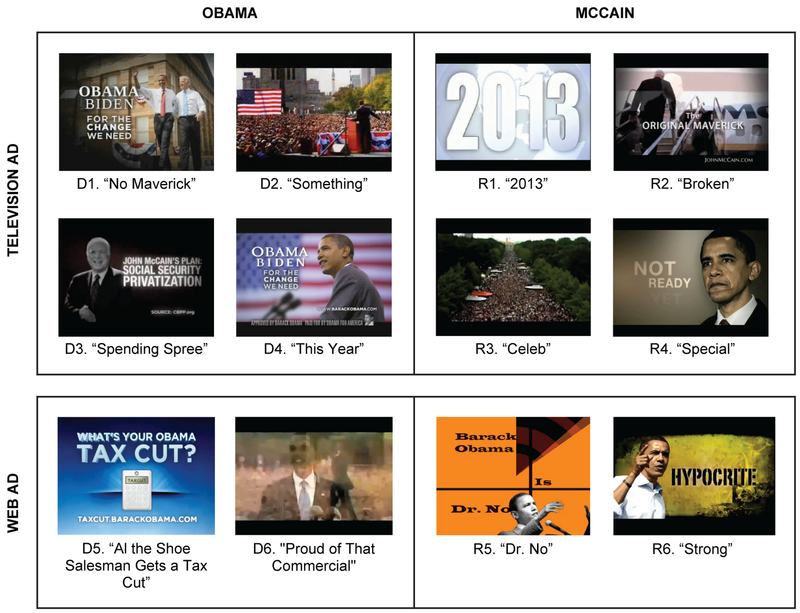 The summary images for the web commercials of both the Obama and McCain ads reveal more distinct textual, graphic and image content than the TV commercials of either candidate. Correspondingly, the line graphs for web commercials have a lower frequency and magnitude of visual change over time. McCain’s TV ads are more visually dynamic. The summary images for McCain TV commercials are noticeable blurrier than those produced by the Obama campaign. This is matched by the line graphs spiking more often and with greater intensity. We can also zoom out and look for patterns in visual change by taking all frames in the sample set as the unit of analysis. Fig. 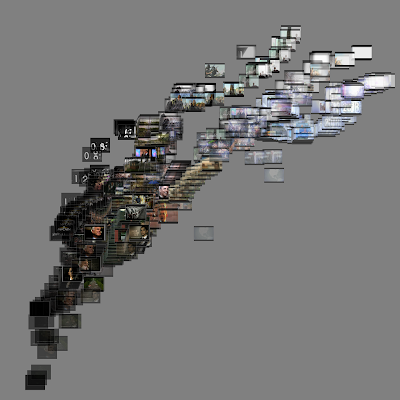 2 and 3 are image maps that take regularly sampled frames (at 12 fps) from all of the ads and represent them together on two dimensions. Fig. 2a. 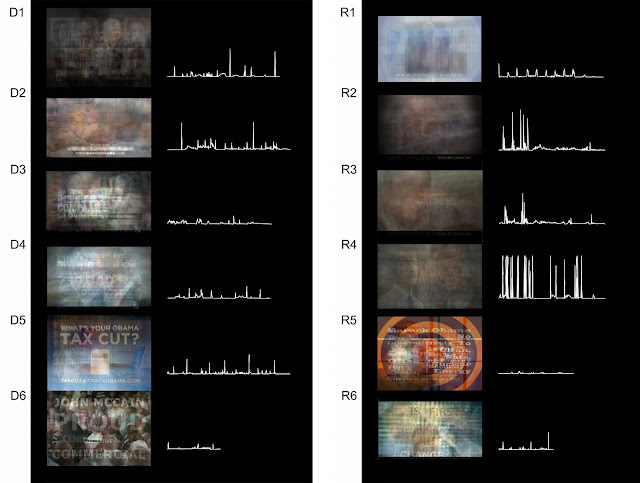 ‘Image Map’ Comparison of TV Video Ads. Fig. 2b. ‘Image Map’ Comparison of TV Video Ads. Fig. 3a. 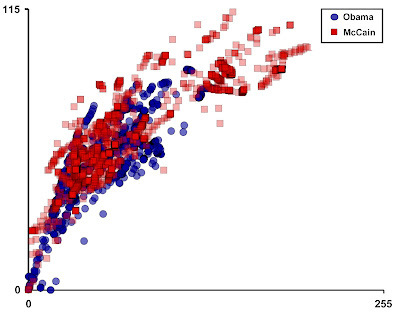 ‘Image Map’ Comparison of Obama TV ads. Fig. 3b. ‘Image Map’ Comparison of McCain TV ads. Notice how the distribution of frames drawn from ads produced for web broadcast is scattered, with no apparent normative trend line tying them together whereas the ads produced for television broadcast, a medium with an established history of visual development, have a distinct core. And how, when looking at the subset of ads produced for TV, the frames drawn from the McCain commercials are frames that reach the extremes of the distribution. This is closely related to the earlier observation of these same ads being more visually dynamic in terms of movement. There is a difference between the campaigns in the visual characteristics and form they choose to broadcast on the traditional political advertising medium of television. And interestingly, the results of digital image analysis challenge our prior assumptions. If the Internet was indeed a revolutionary force in the 2008 U.S. presidential campaigns, then we might expect to see this change reflected in the visual design of campaign advertising and communication. As the numbers reveal, we do. However, the implications and parameters of the patterns that emerge from the data may deviate from our expectations about how developing medium of online video should look and should function. Based on surrounding political rhetoric, public opinion and party lines, we might expect that media team for Obama, the younger and popularly labeled more “dynamic” candidate would design commercial advertisements that showcase this dynamism. Yet, at least for this small sample set, visual analysis reveals otherwise. John McCain’s TV ads comparatively more visually radical, at least for the small-scale sample set of this study. Could there be a political message correlated with the design of the McCain TV ads that asserts ‘maverick’ in response to Obama’s message of ‘change?’ Maybe. Further, why is this pattern visible in ads produced for television and not those produced for the web? If we’re interested in the looking at the changing face of political communication , these questions might be worth pursuing.